This reminds me of the instant mango pickles that used to be served at weddings (and probably still is but I haven't been to a wedding in India in over a decade now). I used to have them by spoonfuls! Photo looks fab, P! Wow!! !mouthwatering....i love this instant pickle Mythree...Thanks for sharing. 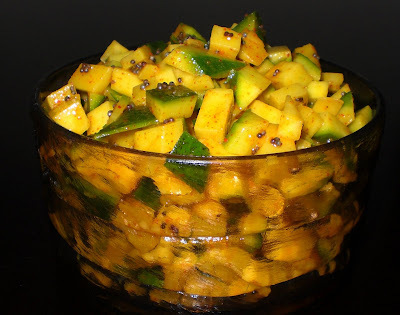 great recipe of mangai oorugai, brought back memories of summers in India. Will be making it this weekend. Its a mouthwatering pickle ...regular at our home in summer! I am feeling nostalgic! Hey you have been tagged...and a Magic Lamp of Good Luck is passed on to you! Gorgeous recipe! Thanks for a great entry! i think i'll try this, together with curd rice! Btw, the round-up is now on. Thanks a loot for the recipe..